Mapping strath terraces in the Reno Valley, Italy with Niels Hovius. I have helped teach several course while at ETH: Introduction to Geological Mapping, Basin Analysis and Tectonic Geomorphology. These course involved field work and practical classes. 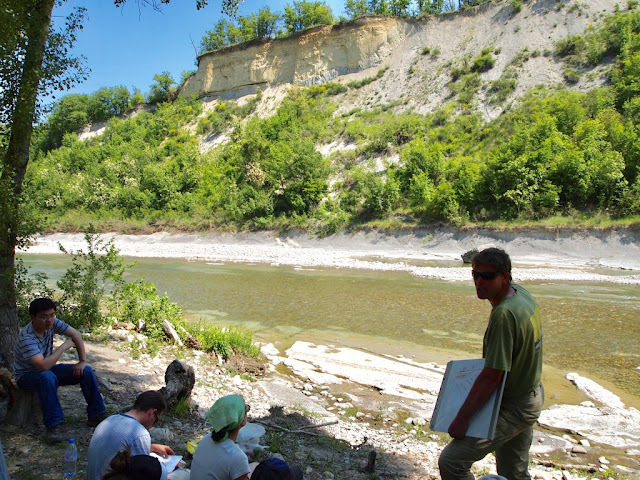 For example, the Tectonic Geomorphology course centred around a 10 day field trip to the Reno Valley in the Apennines, Italy. While in the field, we mapped strath terraces and measured the river’s long profile using kinematic GPS. The practical component involved relating these observations to processes of fluvial erosion and deformation on a buried fault. With this aim, I developed a series of Matlab exercises that were easy to implement and related directly to observations made in the field. I was invited to help with the Geochronology course at Columbia University run by Sidney Hemming in 2014. I led a short course covering the basics of thermochronometry for masters and PhD students titled "Extracting exhumation rates from thermochronometric data". In the course we covered theoretical topics from radioactive decay and general geochronometric methods to basic diffusion. I also provided an introduction to mass spectrometry and the sorts of crustal thermal models used to extract exhumation rates from thermochronometric data. This course also included a two hour practical using Matlab scripts to analyze thermochronometric data.